Weddings with a brown and blue color scheme are great for outdoor, casual or more formal weddings. Select dresses from a range of blues, such as aquamarine, royal or navy to pair with taupe, dark wood or sandy brown. Bridesmaids will look breathtaking in airy, blue gowns with brown satin sashes. Blue is a crisp, cool color that flatters many skin and hair tones. A chocolate brown colored wedding cake may be too dark for some. Couples can incorporate their blue and brown color scheme into the cake by adding accents, such as brown silk or fondant ribbon at the base of the layers. 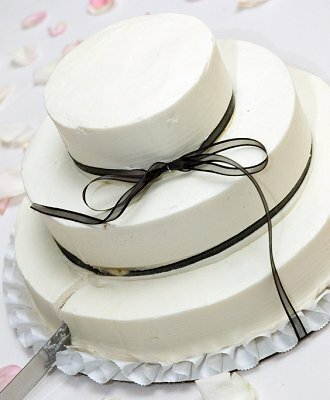 Arrange blue silk or sugar flowers on the top of and along the layers of the cake. Carry over the flower choices from the bouquet to the cake. Pick brown morning suits with pinstripes for your groomsmen. A sky blue tie with an interesting pattern will look stylish and sleek. Pale blue or cream boutonnieres look snappy and elegant against the brown of these suits. From young to old, brown is the perfect suit color for a morning or noon wedding. Chocolate cake toppers shaped like the bride and groom are sweet and memorable. Ask a local baker to create an image of the couple from a photo. Small details like blue flowers in the bouquet and his brown suit will make this theme come to life. Jazz up a wicker basket with brown and blue ribbon. Wrap the handle with blue tulle and brown silk flowers. Use a hot glue gun to attach flat flowers to the outside of the basket. Create a family feel at the wedding by using long banquet tables and bright blue table covers. Festive brown chargers make excellent decorations for place settings. Crisp, white linen napkins and crystal glass wear add an air of elegance at this reception setting. If you want the reception to have a classy look, use round tables and abundant tablecloths for a traditional appearance. Place folded linen napkins on the dinner plates, securing the napkins with a brown wire napkin holder.